Islands are intrinsic parts of the Indian Ocean Region’s physical geography and human landscape. Historically, many have played substantial roles in the regional cultural and economic networks, as well as in the regional political developments. Today, at least three issues bring these islands back to the forefront of the regional and global affairs, namely geopolitics and strategic matters, environmental conditions and challenges, as well as ocean affairs. However, there has not been yet a lot of research and publications on this phenomenon of islands’ growing significance in the specific context of the Indian Ocean Region. 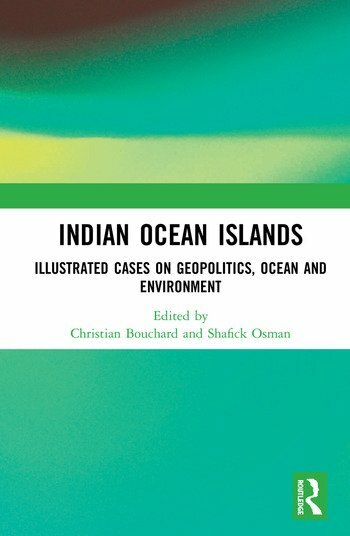 This book provides a rare attempt to cover various issues related to geopolitics, international relations, history, security, anthropology and ocean/environment of Indian Ocean islands and their societies. More specifically, it provides case studies on Sri Lanka (foreign policy), Cocos and Christmas Islands (geo-strategy), Chagos Archipelago (history), Mauritius (‘Indo-Mauritians’), Mauritius and Seychelles (maritime security), European Union and the Indian Ocean Islands (international relations), and Sundarban islands (environment and society). The chapters were originally published in a special issue of the Journal of the Indian Ocean Region. Christian Bouchard is the Coordinator of Environmental Studies (French) at Laurentian University, Canada, a founding member of the Indian Ocean Research Group (IORG), and an Associate Editor of the Journal of the Indian Ocean. Shafick Osman is a Research Associate at the Florida International University (USA), Deputy Editor-in-chief of Outre-Terre (France) and a member of the Society for Indian Ocean Studies (New Delhi) and IORG.